Ironically the reporting done by CBC has more propaganda than anything. For those who don't know (9/10 people I tell don't), that CBC is state-run and controlled media. CBC is not only a government owned and controlled Crown Corporation, but it's CEO is appointed directly by the Prime Minister and always has been. Further, what Propaganda are they talking about in this article? "Don't listen to any rumours" and "stay calm", "Oppose ethnic separatism and hatred"? Yes, that sounds like real Propaganda, is that why our government refuses to diffuse the racial and religious tension in Canada? Not once have I heard any government official call for peace, harmony and unity within our control, especially not Stephen Harper. In comparison, the government in China has always called for this and repeated this call from all levels of government after the violence in Xinjiang. One other comment, is that it is interesting, that while the US and many other countries are violating human rights on a daily basis, racists and religious extremists have used this as a way to target Islam and China in one. Anyone who objectively looks at the facts can see this violence is no random act, and has all the earmarks of CIA organized violence, similar to Tibet, similar to Cuba, similar to Haita, similar to Panama and many other places the CIA creates trouble. Although the media portrays otherwise, I know the majority of Han's and Uighur's believe in living peacefully and harmoniously with each other. The media is only going to show the exceptions to that rule. 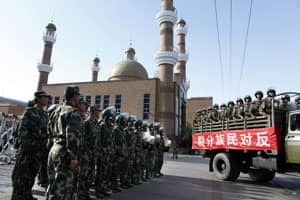 Military helicopters, armoured vehicles and trucks of police officers ramped up the propaganda campaign to maintain order in the capital of China's Xinjiang province on Thursday. 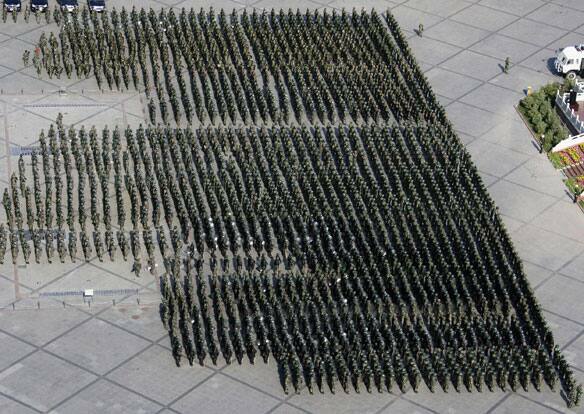 Many of the soldiers sent to quell the violence in Urumqi in the past few days have left, but security forces are maintaining a firm grip on the region. At least 156 people have died in ethnic violence between Han Chinese and minority Muslim Uighurs in the northwestern province of Xinjiang since Sunday. Trucks covered in banners reading "We must defeat the terrorists" and "Oppose ethnic separatism and hatred" rolled through Urumqi as helicopters flew overhead, The Associated Press reported. Armoured vehicles accompanied the trucks as they passed through the Uighur neighbourhood of Saimachang, according to Reuters. Red stickers reading "Don't listen to any rumours" and "Keep calm and maintain public order" were placed outside apartment complexes. The Uighurs say security forces gunned down many of Sunday's protesters. Officials have yet to give an ethnic breakdown of those killed. Following a meeting of China's Politburo, communist leaders called for stability and vowed to pursue punishment to violent rioters. "We must by law severely attack those hard-core elements who planned and organized this incident and seriously violent criminals," the Politburo said. It also called for "preventive measures" against "enemy forces who would undermine ethnic unity," and stressed the need to preserve social stability. Li Zhi, Urumqi Communist party chief, told reporters Wednesday the death penalty will be sought for anyone found to be behind the riot's killings. The protests started in Urumqi on Sunday, when demonstrators gathered to demand justice for two Uighurs killed in June during a fight with their Han co-workers at a factory in southern China. The protests turned into the deadliest ethnic unrest in the region in decades. Officials have said that more than 1,000 have been injured and about 1,400 have been detained. Their relations have often been tense, with the ethnic Han Chinese who predominate in the country. Many Uighurs feel they're discriminated against by the government in Beijing and a Uighur separatist movement has existed for decades.